Middleton’s Club Tavern has been a mainstay for live music on the west side for decades. The bar itself has been around for a lot longer than that and was even featured in the 1975 book, Blue-collar Aristocrats: Life-styles at a Working-class Tavern, a sociological study that looked through the other end of the hippie spectrum during the Vietnam generation, but what excited me the most about the place was the fact that I’ve heard several times from the staff that the Club Tavern was haunted. 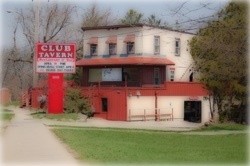 So, I had to go directly to the Moose’s mouth (ba-dum-dum) and ask Moose Werner, the Club Tavern’s owner for the past thirty six years what he knows about the ghost. It’s always fun when you ask someone a question about a haunting and they respond matter-of-factly with an “Oh yeah, there’s a ghost in the building.” And in Moose’s situation at the Club, he says that he even knows who the ghost is. He prefers not to name the ghost in public because it was a personal friend of his, but he’s confirmed that his staff has seen the apparition a few times. So, it’s another reason to catch a live show there. Not only are you going to hear a great band, you just might run into the patron who loved the place so much, he never wanted to go home.